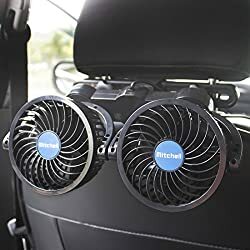 • Brand: Poraxy — P006..
• 360 degree Rotatable 12Volts Electric Dual-Head Auto Cooling Fans for car rear seats..
• Fit all mini compact or medium size Sedan SUV vehicles, vans and trucks..
• Complement weak car air conditioner.. Blow hot air out efficiently..
• Easy to install.. Simply plug into your cars' cigarette lighter..
• Feature two-level speed controller.. 6.5Watt low energy consumption..
• Dual 4-inch heads design.. Removable sturdy headrest mount with chip to secure the fans..
• Effective in removing unwanted cigarettes tobacco smoke or dust..
• Cool down passengers at back seat.. Eliminate pet odor smell..